By Dennis W. Viau; one of my own creations. These lamb chops have a stronger, bolder flavor than leg of lamb. 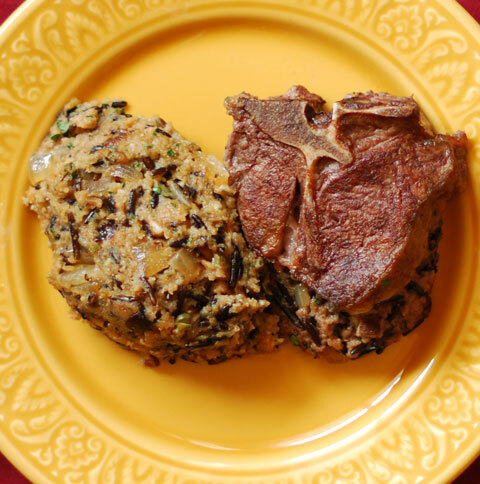 Therefore, they benefit from being paired with stuffing that has plenty of flavor. I also like to eat these with roasted vegetables, which I think complements the flavor of the lamb well. The wild rice will take the longest to cook, so start it first. Bring 1½ cups chicken stock to a boil in a saucepan. Add the rice, reduce the heat to low, and simmer 40 to 45 minutes until tender. Do not drain. Set aside to cool. While the rice is cooking, heat the oil in a skillet over medium-high heat and brown the chops on both sides, about 4 minutes per side. Remove from the skillet and set aside to cool. Place the chopped onions with the optional anchovy in the skillet (using the same oil) and sauté until the onions are tender and translucent, about 5 minutes. Remove from the pan. Sauté the chopped mushrooms, adding more oil (or butter) if needed, until tender, about 2 to 3 minutes. Combine the rice, including the liquid, with the onions, mushrooms, olives, and capers. Mix well. Add the bread crumbs and parsley. Mix together, adding the remaining ½ cup stock if needed for moisture. Add the Gruyère and sage. Mix. Adjust for salt and pepper. Heat oven to 375°F (190°C). Cut a deep pocket in each chop, cutting from one meaty edge inward to the bone. Place about 1 rounded tablespoon of filling in the pocket of each chop. Put the remaining stuffing in a separate baking dish. Arrange the chops in a baking pan. (The shiitake stems can be placed in the bottom of the pan for flavor.) Pour ½ to ¾ cup (118 to 177ml) wine in the pan. Roast, uncovered, to an internal temperature of 135 to 140°F (57 to 60°C), about 25 minutes. The additional stuffing can be baked at the same time. Let rest at least 5 minutes before serving. Strain the pan juices for garnish or to make gravy.